Kitesurf is not a difficult sport. Learning an extreme sport in a few days is a luxury few sports can afford. Learning Kitesurf in Tarifa is not difficult but it requires safety. Kite Local School Tarifa has the latest Kitesurfing equipment in the market, a rescue boat, and one of the most innovative teaching certification in Kitesurf. You will be learning Kitesurf in Tarifa in full safety. With Kite Local School you can decide either you want to just discover what Kitesurf is in a discovery course, to reach a certain level in Kitesurfing or to do the full course to reach independency. In order to be fully independent in Kitesurfing, you will need to have ridden a certain number of hours. Generally, independency is obtained after 12 to 15 hours of lessons, from 2 to 3 hours per day. Nevertheless, Kite Local School does everything possible so that you have fun from the first hour of course. 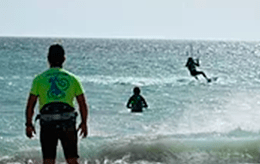 Each step or level is compulsory in order to practise correctly Kitesurf in Tarifa. You will learn the essentials and all the safety rules. A step or level of progression lasts from 2 to 3 hours. The essential discovery lesson. You will learn the basics: Kite control and safety rules. First contact with Kitesurfing on water. You will feel the power of the Kite on water. 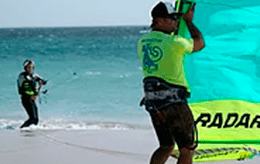 Master the Kite on water and do your first stand up board trials. Navigate with total independence, go and return to the same point. 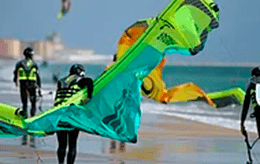 Kite Local School offers you many choices so you can practice Kitesurf independently in Tarifa. You can choose a basic course if you are completely beginner in Kitesurf or you have already practise a little. If you are already independent, you can take an advance lesson to learn new techniques or strapless Kitesurfing. First experience with Kitesurf in Tarifa? This type of lesson is made for you! Have you practice Kitesurf some years ago and you need a refresh? This type of lesson is also made for you! Even if you ride little and you consider you haven’t reached independency yet we advise you to take one of these three formula lessons. A certified instructor will be teaching 3 to 4 students with a single kite . We strongly advise students to know each other for they will be assisting mutually all the time. A certified instructor will be teaching two students. The lesson will be more fitted to the progression of the students. You will learn twice as fast than a group lesson. Our top certified instructors will be fully available for a single student. It is the type of lesson we recommend the most, because it is the one the student will learn more and faster. Remember Kitesurf is a sport practice by a single person. At the end you will be alone riding on the board. An instructor will always be looking for your safety. The equipment and rescue boat are not included. A certified instructor will teach you what you are looking for : small jumps, big air jumps, tricks or simply improve your kite navigation. If you want to discover this whole new world inside the Kitesurfing world, a certified instructor will be pleased to teach you how. These prices include TVA. Discounts are available on low season. Just contact us to know more.